LONDON: The military coup in Egypt has divided the Middle East and North Africa while creating bizarre new bedfellows. Supporting the coup are Syria as well as the conservative Gulf monarchies and pro-Western Jordan that have been preeminent in backing the anti-Syrian regime. Turkey and Tunisia have joined Iran in opposing it. While Israel, Libya, Yemen and Hamas in the Gaza Strip have withheld comment, Palestinian Authority President Mahmoud Abbas has praised the Egyptian army for its action. Algeria opted for a tightrope walk, urging Egyptians to reach consensus based on unity, national reconciliation and respect of the constitution and expressing hope that the approach would satisfy “the legitimate aspirations of the Egyptian people.” Evidently, scars were left by the decade-long civil war that consumed nearly 200,000 Algerian lives after the military junta cancelled a second round of elections in 1991 when the Islamic Salvation Front was poised to win a two-thirds majority in the parliament. Since December 2010 the region has been in the throes of turmoil variously called the Arab Spring, Arab Awakening or Arab Revolutions – focused on giving citizens the right to choose their governments freely. The common aim of this movement has been to end autocracies, be they secular nationalist or monarchical. Though not an Arab country, Turkey took keen interest in the events unfolding in Arab North Africa. Turkey is a republic ruled under a series of secular constitutions since 1923, and Prime Minister Recep Tayyip Erdoğan showcased its political system as ideal for the people struggling to overthrow secular dictatorships in North Africa. His tour of Egypt, Libya and Tunisia in September 2011 highlighted his ambition. Since 2010 the Middle East has been in the throes of turmoil over citizens’ rights to choose governments freely. Two months later the emergence of the Islamist An Nahada , or the Renaissance, as the dominant party in the coalition government in Tunisia went down well with Erdoğan, leader of the Islamist-rooted Justice and Development Party. So too did the election of Mohamed Morsi of the Muslim Brotherhood in Egypt in June 2012. Morsi was one of the leading foreign guests at the Justice and Development Party’s fourth congress in Ankara on 30 September. Remarkably, the leader of Turkey’s secular opposition Republican People’s Party, Kemal Kililçdaroğlu, declared that “Military coups cannot be accepted.” His group backed the all-party resolution in parliament condemning the military takeover in Egypt. In contrast, within hours of Egypt’s defense minister and army commander-in-chief General Abdel Fattah al Sisi naming the constitutional court chief Adli Mansour interim president, Saudi King Abdullah sent a congratulatory message. Rulers of the United Arab Emirates, Kuwait and Jordan rushed in the footsteps of the Saudi monarch. Egypt’s General Sisi named an interim president; the Saudi king sent a congratulatory message within hours. So too, surprisingly, did Shaikh Tamim bin Hamad al Thani, freshly installed ruler of Qatar – under the guise of respecting “the wishes of the Egyptian people.” His father, as well as the influential and Qatar-funded Al Jazeera TV, had backed the Muslim Brotherhood in the region to establish Qatar as a regional powerbroker rivaling Saudi Arabia. The long simmering rivalry between tiny Qatar and the behemoth Saudi Kingdom solidified on their respective policies towards the Muslim Brotherhood. The Brotherhood was founded by schoolteacher Hassan al-Banna in 1928 with the aim of reconstructing Muslim societies in accordance with “the commandments of the Quran and its teachings.” After Egypt’s military ruler, Colonel Gamal Abdel Nasser, outlawed the Brotherhood in 1954, one of its activists made an unsuccessful attempt to assassinate him. The state repression that followed sent Brotherhood leaders into exile in Saudi Arabia. During the subsequent decades the Saudi kingdom became a haven for Brotherhood activists facing persecution in other Arab countries. These exiles played a crucial role in running Saudi educational institutions and the transnational organizations that Riyadh founded to counter Arab nationalist and leftist parties. During the anti-Soviet jihad in Afghanistan in the 1980s, the Saudi government used the Brotherhood’s network to recruit non-Afghan Muslims to sign up as mujahedin, or holy warriors. The rupture developed after the Saudi regime invited US troops to the holy soil of Arabia in 1990 to expel the Iraqi occupiers of neighboring Kuwait. Following the 9/11 attacks, alienation between the two sides escalated to undisguised hostility. The late Saudi Interior Minister Prince Nayef, a hardliner, singled out the Brotherhood as a radicalizing force among Saudi youths. 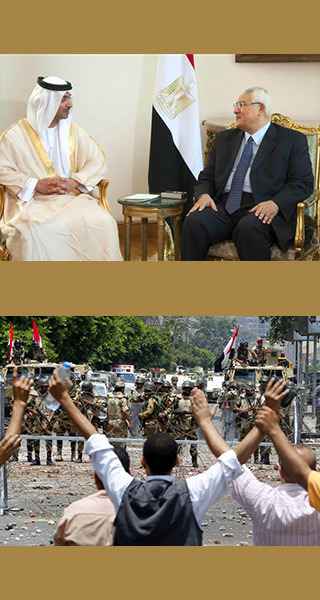 Little wonder that Riyadh backed the relentless persecution of the Brotherhood in Egypt by President Hosni Mubarak. With his rule threatened in late January 2011, the Saudi king offered refuge to Mubarak as he had done earlier in the case of Tunisia’s autocratic president. Whereas Zine El Abidine Ben Ali accepted the offer, Mubarak stayed in his palace. As firm believers in absolute monarchy, Saudi royals are at odds with the Brotherhood’s participation in elections. The Brotherhood’s electoral success in Egypt and Tunisia, the cradle of Arab Spring movement, unnerved them. In reactions to Egypt’s coup, what counts is acceptance or rejection of the ballot box as the sole source of power. Saudi Arabia, Kuwait and the UAE have jointly provided Egypt’s military regime with grants and loans worth $12 billion, overshadowing the annual $1.5 billion in US aid in Egypt. A few Republicans in the US urged cutting off the military portion, but Israel has asked that it be maintained in support of the 1979 Egypt-Israel Peace Treaty. Reactions to Egypt’s coup show that, in the final analysis, what really counts is the acceptance or rejection of the ballot box as the sole source of power. Hereditary rulers prefer secular dictators in the Arab republics rather than popularly elected Islamist presidents. And this makes redundant the thesis gaining currency that what matters most is the age-old Sunni-Shia divide in the Middle East and North Africa. Dilip Hiro is the author of “Apocalyptic Realm: Jihadists in South Asia,” (Yale University Press, New Haven and London). His latest book is “A Comprehensive Dictionary of the Middle East” (Interlink Publishing Group, Northampton, Massachusetts, and London). Click here to read an excerpt. It’s in China. Welcome to Urumqi. Urumqi, capital of Xinjiang, the autonomous region that together with Tibet makes up China’s western edge, is a bubbling, gritty metropolis, and probably the most cosmopolitan place between Shanghai and Istanbul. On the surface, Urumqi resembles most second-tier Chinese industrial hubs. But, with its myriad advertisements, signs and business placards in Chinese, Uighur, Russian, Kazakh and Kyrgyz — written in Chinese, Arabic or Cyrillic scripts –Urumqi is no ordinary Chinese city. In fact, it has emerged as the de facto capital of a revived Central Asia, a region poised to assume a higher profile in the world’s energy, diplomatic, and cultural scenes. On the street, in the immense electronics, clothes, and kitchenware markets, and in the 24-hour all-inclusive spas used by traders as cheap hotels, the signs of Urumqi’s variety are everywhere. You regularly find pudgy Guangzhou businessmen next to nervous-looking Pakistani merchants from Peshawar, standing across the street from entire Russian families, dressed in white, as if on vacation in the Greek Isles. Iranian truck drivers commiserate with Farsi-speaking Tajiks, and entrepreneurs from Mumbai and Bangkok haggle in English with local Uighurs hocking goods manufactured in Shenzhen. The Turkic peoples of Eurasia: Kazakhs, Kyrgyz, and Uzbeks, and even some Turkmen and Azeris, mingle with Uighurs and Turks from Anatolia: all groups who share a language family that is still prevalent in Xinjiang. They are all here for one reason: to do business. The elderly shuttle trader with her overstuffed cargo bags will buy plastic Chinese merchandise and then, following a flight or bus trip back to a remote region like Karakalpakstan, Uzbekistan, will re-sell these goods at inflated prices. The mid-range container-owner is here to fill rail carriages with air-conditioners, laptops or nylon carpets to travel back to the bustling bazaars of the Ferghana Valley, where he will re-sell his items in bulk to retailers in affluent Kazakhstan or Russia. The big businessman is here to open a new branch office for his rapidly-growing commercial empire. Urumqi, farther from the sea than any other city in the world, has all of the brands and services available in China’s coastal cities. It is just that they’re a bit more rough-and-ready: The latest Samsung smartphone is still in its bubble wrap, while the flashy BMW is still on the transport truck. The official population of Urumqi is around 3 million, and the majority of these people are Han Chinese, not Uighur. But the real population is probably substantially higher. GDP per capita, at around $11,000 is almost double China’s average and just below that of cities like Beijing and Shanghai. This isn’t an accident: the Chinese government has cultivated Urumqi at the expense of Xinjiang’s traditional trading cities of Turpan and Kashgar. Anyone flying from coastal China to Central Asia almost always must stop in Urumqi first. The city also serves as the hub for China’s major railway and pipeline arteries, connecting the country’s major cities with Central Asia, Russia, and the Middle East. It’s of little surprise, then, that such a wide variety of travelers find their way to the city. Urumqi’s cosmopolitan profile hasn’t gone unnoticed in Beijing. For the last three years, the Chinese government has devoted a lot of resources to the China-Eurasia Expo, the region’s premier trade fair and an aspiring Davos. Last year, the six-day event included speeches by Premier Wen Jiabao and a host of regional leaders, from the Central Asian states to Pakistan, Turkey and the Maldives — even professional conference-goers like Tony Blair dropped by. Tens of billions of dollars worth of deals were made, with everything from Kyrgyz kalpak hats to Chinese tractors on display. The Afghans touted their mineral deposits, the Kazakhs their oil and local Xinjiang potentates repeatedly stressed the opportunities of investing in Xinjiang. This year’s expo, scheduled to take place in early September, has been promoted around the world, from Helsinki to Kuala Lumpur. Urumqi’s role as a regional locus is mainly due a fortuitous location and culture. During the Qing Dynasty, Urumqi became an administrative center because it was here that the Manchu Bannermen crushed the Zhungarian Mongols, who had long threatened to cut eastern China off from its western domain. It is a fertile plain in the middle of Xinjiang’s deserts, and its location on a natural route across the Tianshan mountains into Central Asia and Russia make it as suitable a hub as anywhere nearby. Today, Urumqi is the closest major Chinese city for Central Asians who wish to buy merchandise, and the closest major Central Asian city for Chinese who wish to sell it. And, it is a chief selling point that the two major languages of the region, Mandarin and Turkic Uyghur, are spoken here with equal fluency. Distant, obscure Urumqi also may loom large for the United States’ plans in the region. At the moment, the major plank of the Obama Administration’s policy for Central Asia after the withdrawal of combat troops from Afghanistan is the cultivation of a so-called New Silk Road consisting of economic integration across the region that will turn Afghanistan into a roundabout for trade and transport. However, Washington’s “North-South” strategy not only ignores the the reality that — at least at the moment — Central Asia generally trades east-west, but also the existence of a major regional trade hub: Urumqi. As opposed to a commercial corridor dictated by geopolitical priorities, Urumqi is a natural focal point that sits between the production in central and eastern China on one side and the markets of Russia, the Middle East and Europe through Central Asia on the other. This is not to say that it is in the United States’ interest to support the growth of an already booming Chinese axle with various Eurasian spokes. But it is imperative that any American policy take into account the regional realities of commerce and cultural interconnection. Afghanistan and South Asia may well be economically integrated with Central Asia. But when this happens, no city will be better positioned to capitalize than Urumqi.